I started playing tennis when I was three years old. I went to a weekly group at Pershore Tennis Centre, in Worcestershire, a county in the heart of England. This was my introduction to tennis. Over the following years, I learnt the basics of playing tennis and, at the age of 8, felt that I was really improving. I developed an interest not just in playing tennis but also watching the professionals on TV. And so my real passion for tennis began. I remember watching Andy Murray win Olympic gold in London on television in 2012. I was also in the Olympic Park with my family when he and Laura Robson won silver in the mixed doubles which we watched on the big screen there. Ever since, I have dreamt of becoming a professional tennis player. My biggest influence to date is Roger Federer and my first mini tennis racket was a Wilson Federer (I still have it now!). I have always loved watching him. I even started wearing a bandana because of Federer – and still do today. 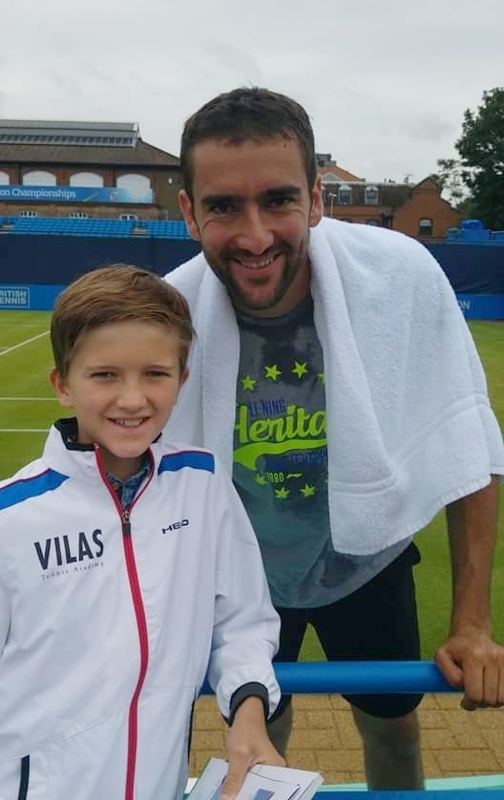 I also love Del Potro and I have just come to like Dimitrov and Zverev. Since turning 8, I improved and moved into squads with some of the stronger players of my age in my Pershore club. In 2013 Andy Murray won Wimbledon. Watching him got me wanting to compete more. Up to that point, I had only played internal mini red competitions. I did not start competing properly until green ball level. Under the guidance of the club’s head coach, Steve Bauer, I began to have some individual lessons. I just loved the thrill of hitting a tennis ball and especially trying to hit the ball hard. (This I believe is why I hit plenty of winners today!). By learning better technique and the necessary basics of tennis in my weekly one-on-one with Steve, I gradually upped my skill level. This improvement led to me starting my journey on the tennis ratings ladder. I am quite a visual learner and have spent hours watching YouTube videos of the pros. This really helped me develop, although my coach would always notice I was trying something new as I like to experiment and try to replicate their shots and technique. In green ball tennis I competed most Sundays and used the competitions as part of my training, trying to put into practice what I was being taught. I found that by playing and competing I quickly developed my shots and also started to make lots of friendships. It was really impressive to see the level of the many players who competed regularly. My Dad always calls this 'The Andy Murray Generation'. In my final season of mini green tennis, I got the chance to represent my county Hereford and Worcester. I started going to watch professional tennis events live such as the Davis Cup, Nottingham ATP, the ATP finals in London and my favourite event, Wimbledon. Watching the pros up close always inspires me and with my parents' and coaches' guidance, I started to develop a good training programme. This set me up to improve going into full ball tennis. I have represented my county at 12U County Cup and hope to be a part of that again next summer in 14U. In 2014, I had my first experience of a tennis academy. 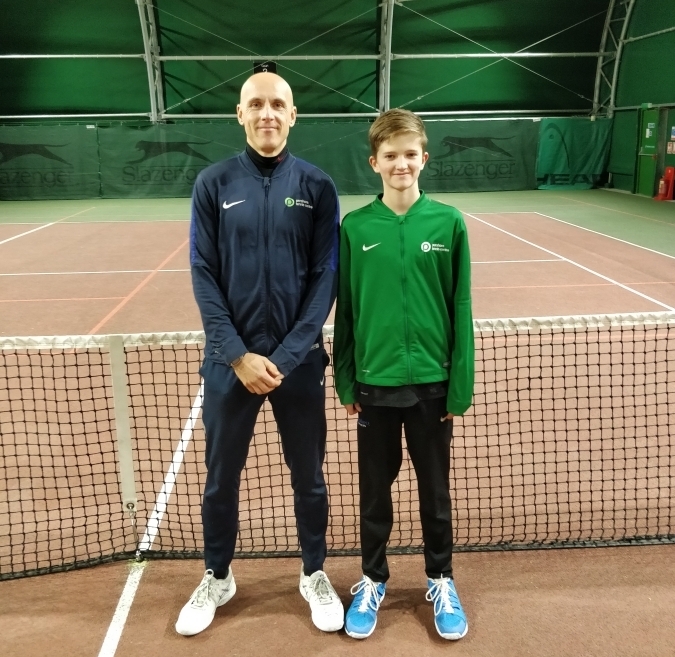 I went to Annabel Croft's camp at the National Tennis Centre for a week. (A few weeks later I was invited to go into the Sky Sports commentary box with her while at the ATP finals). Again I was really inspired and knew I really would love to be a professional tennis player when I was older. I also realised I love working hard. I have since made six trips to the Vilas Tennis Academy in Mallorca, all of which helps when I go back to my programme at home. Each time I return, I work harder and I’m more eager to improve. I love competing, although it’s tough at the level I’ve reached. With hard work, dedication and my love for tennis, I am determined to focus, win more matches and move up the rankings.